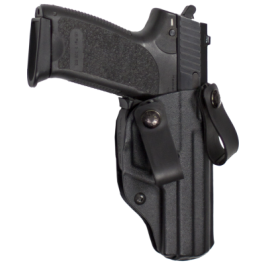 Our Nano IWB holster is one of our most popular concealment holsters. It is ultra-thin, being constructed of the same tough materials we use on all our Classic handmade, custom and semi-custom holsters. It is made from our thinner .080 material, resulting in a narrower more comfortable and concealable holster with a very minimal print signature. 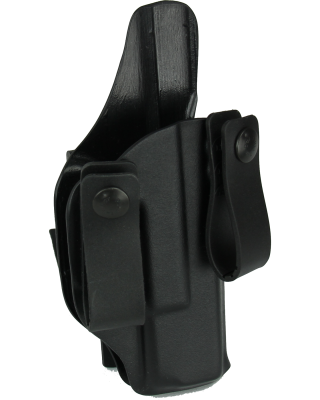 The “Pull the Dot” snap IWB belt loops are adjustable for FBI Cant and Straight drop carry and can be adjusted for belts from 1 ¼” to 1 ¾”. On the Nano we have eliminated the second tension screw reducing the Nano’s side profile while still keeping our tension adjustment feature. The Nano will not collapse making re-holstering sure and easy. It features a full length sweat guard to prevent pistol to body contact while still providing a full combat grip. 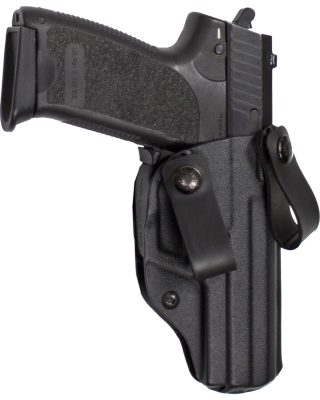 The Nano is another great choice for concealed carry over long periods of time.